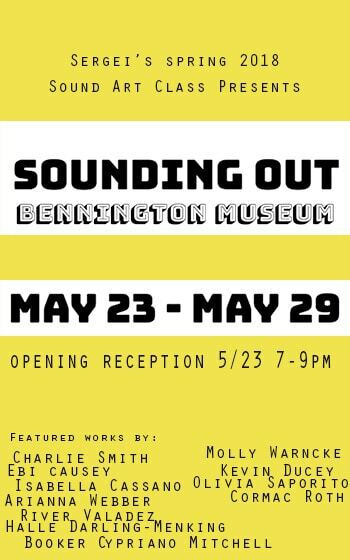 This exhibition features new works by Bennington College students in the class Sound Art, taught by Sergei Tcherepnin. The idea behind the class has been to take an interdisciplinary approach to sound, examining sound as a relatively new medium within contemporary art. We looked at how sound has entered the discourse of contemporary art practices since the mid-20th century through now, focusing on conceptual and performance art practices, and how these movements set the stage for sound art. Students were asked to think from the beginning of the class about how they might contribute their own voices to this discourse, particularly in thinking about how to put together this group-curated exhibition of new works, created specifically for the Bennington Museum. The works on display range in style and often defy categorization. They converse with far-ranging themes and art movements, including, but not limited to Land Art, Synesthesia, Installation Art, Sculpture, Performance, Video, and more. What all of these works have in common is their deep engagement in the medium of sound, and an inventiveness in how to present sound together with sculpture and other visual means to foreground the act of listening as a vital social activity.